Random House Books for Young Readers, 9780375868306, 415pp. JONATHAN STRAHAN is the editor of more than 40 books, including the Locus and Aurealis award-winning anthologies"The Starry Rift, Life on Mars, The New Space Opera"(Vols. 1 & 2), the bestselling"The Locus Awards"(with Charles N. Brown), and the Eclipse and the Best Science Fiction and Fantasy of the Year anthology series. He won the World Fantasy Award for his editing in 2010, and has been nominated for the Hugo Award for his editing four times. He has also won the Aurealis Award three times, the Ditmar Award six times, and is a recipient of the William Atheling Award for his criticism amd review. He has been Reviews Editor for"Locus: The Magazine of the Science Fiction And Fantasy Fields"since 2002." 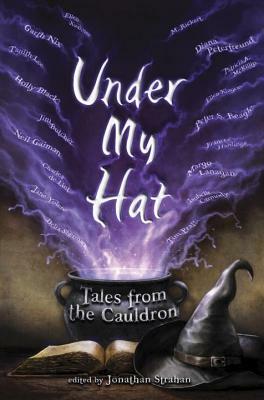 Eighteen short tales about witches by some of the wickedest names in fantasy make for a rich anthology. . . . The writers are simply stellar: Ellen Kushner, Frances Hardinge, Charles de Lint, Tanith Lee, Ellen Klages and Holly Black, among others. Neil Gaiman’s contribution is a witchy, weird poem. Garth Nix’s “A Handful of Ashes” features a library and librarian. Delia Sherman’s “The Witch in the Woods” is beautiful and romantic, with deer and bear shape-shifters and no small darkness. Jim Butcher has a Harry Dresden story (“B is for Bigfoot”), and it’s terrific. Jane Yolen makes Hans Christian Andersen’s life a tale itself, and Patricia McKillip’s “Which Witch” makes loud music and crow magic elegantly. The best, however, may be Peter S. Beagle’s “Great-Grandmother in the Cellar” (yes, she is, and she goes back there, too, but not the way she came, in this "Sleeping Beauty" variant). Readers will find much to enjoy. . . . This 18-story anthology, featuring such notable authors as Garth Nix, Ellen Klager, Margo Lanagan, and Patricia McKillip, offers up an enjoyable witches’ brew of tales. In Charles de Lint’s “Barrio Girls,” two teen fans of vamp fiction find the genre’s glamour diminishes upon meeting a nasty, real-life brujá. Neil Gaiman’s eloquently and evocatively written “Witch Work” explores the power of witchery, emotions, and nature. Jane Yolen’s “Andersen’s Witch” interweaves elements of the iconic author’s life and writings into an inventive meta-tale. These mature, edgy stories feature supernatural elements and also deal with resonating themes, from bullying to self-discovery and self-determination. The mainly young adult protagonists, whether they encounter, become, or already are witches, find their lives transformed--and sometimes transform the lives of others--in diversely magical ways. Editor Strahan’s introduction provides background and context for witches and witch types (and also touches upon the origins of the infamous pointy hat). Lively author biographies are appended. Eighteen notable authors brew up some real magic in this enchanting collection of brief tales about the witchy ways of witches. Strahan’s introductory note explains that his inspiration to create such a collection came directly from his fascination with Terry Pratchett’s Discworld, and readers who found a friend in Tiffany Aching will find plenty of kindred spirits here. The tones range from smartly snarky, as in Frances Hardinge’s “Payment Due,” in which a teen witch uses her powers to harass the repo man, to sweetly romantic, as in Delia Sherman’s “The Witch in the Woods” in which a shape-shifting healer must fight for her love’s life. Neil Gaiman casts a spell with a possibly funny, possibly melancholy, but definitely odd poem, while Holly Black, Tanith Lee, and Charles de Lint play on themes of expectations and reality. A few stories are a little overtidily concluded, but several close on an enticingly open note: the final scene of Ellen Klages’ “The Education of a Witch,” involving a vindictive preschooler, is especially haunting. So grab your hat, your wart, and don’t forget the eye of newt—you’ll want to spend the witching hour and more with this coven. This collection of short stories has one common theme: witches. Good, evil, male, female, old, and young–these magical beings and tales of their exploits are all included. The anthology starts and ends with the best of the bunch, kicking off with Diane Peterfreund’s “Stray Magic,” which tells of a stray dog rescued by a shelter worker that begins to communicate with her and pleads for help finding her master (a wizard to whom the Labrador is the “familiar”). The final story is Margo Lanagan’s “Crow and Caper, Caper and Crow,” another gem detailing Pen, an aging witch, embarking on a journey across the sea to bless her brand-new baby granddaughter–but the clever witch is in for a surprise when she lays eyes on the new addition. Peter S. Beagle’s “Great-Grandmother in the Cellar” assaults readers much like the protagonist’s great-grandmother claws her way out of the dirt in the wine cellar where her bones have been buried for years. Yet, great-grandmother is the good witch in this spooky tale. Another standout is Ellen Klages’s “The Education of a Witch,” about a young girl’s growing fascination with witches. It includes the most memorable scene in the book. As supernatural-themed stories are extremely popular and good short-story collections are hard to find, this one is an excellent addition. Though a few of the selections are wordy and not particularly compelling, the great ones more than make up for them. Fantasy lovers will enjoy the great stories by authors they are familiar with but also some new ones to add to their reading lists.